Mouthwatering, good value, burgers is what you get at Getta Burger. The brainchildren behind That BBQ Joint have ventured south of the river and opened up a cute little eatery in a location that I wouldn't expect. The corner of Creek Road and Bernecker Street is where you will find this smell-worthy establishment. 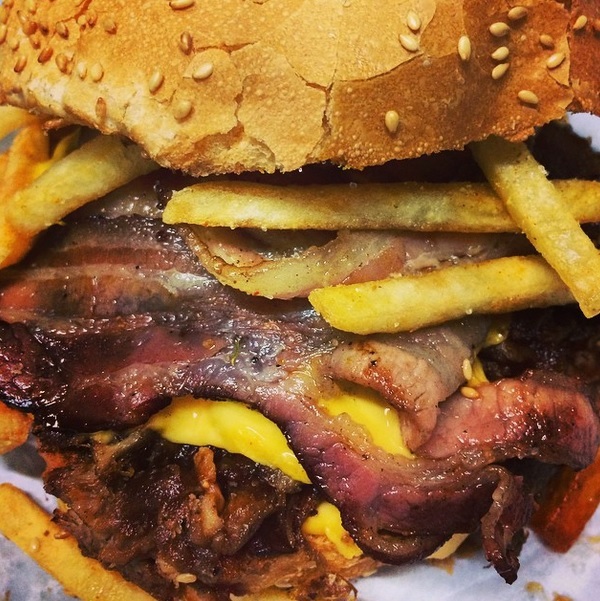 Getta Burger prides itself on "Just good burgers," hand crafted burgers and smoked meats using fresh ingredients. I am no burger expert, but that motto sounds pretty good to me. Nine burgers have made their way onto the epic menu and their names do mean business. I was lucky enough to sink my teeth into their Getta Beef Brisket Burger (unfortunately I did not take the best picture of this burger as I was way too busy devouring it in all its pickled goodness). 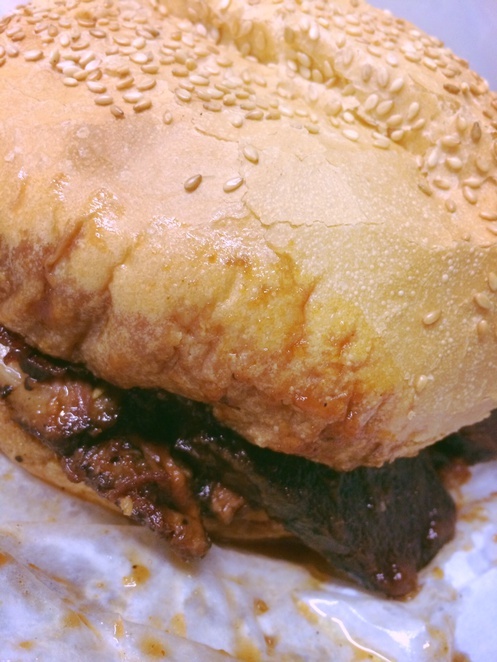 This burger, of epic proportions, combines 12 hour smoked beef brisket with cheese, pickles slaw and That BBQ Sauce. The size was ample, and there was a decent serving of brisket and for just $11, you cannot pass this baby up. My partner opted for the Getta Pig Out (pictured above). This was a winner for him and he was quick to mention that this was the best burger he has tasted in Brisbane this far. Did I mention that he comes from London? There are burgers on every corner, it is on par with the USA. Anyway, the Getta Pig Out cleverly encases pulled pork, crispy bacon, double cheese, That BBQ Sauce and is topped with a helping of their smoked salted fries. Absolutely delish. I managed to snag a bite and let me tell you, it packed a good flavour punch. Seeing as Getta Burger is our local, I will be making my way to this restaurant again to try every burger it has on offer. Stay tuned.